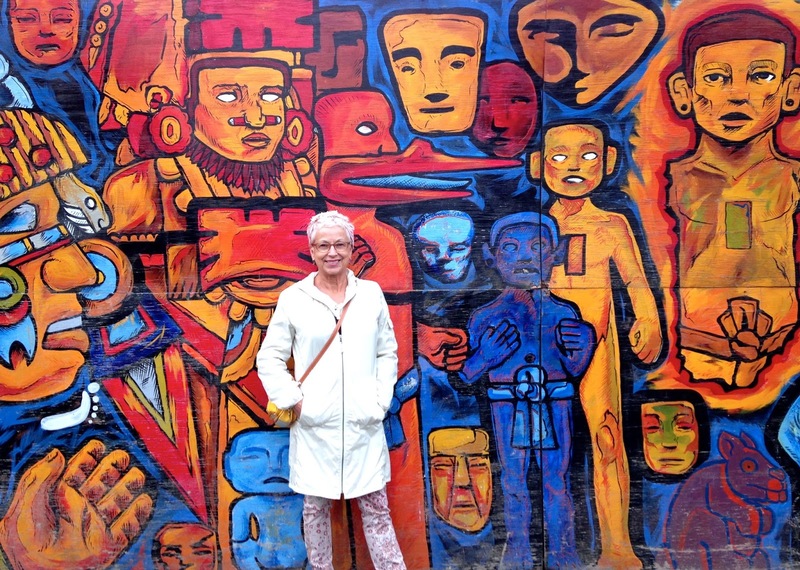 I'm standing in front of a mural at El Templo de Mayor. Note that I am the same height as the Blue Man. 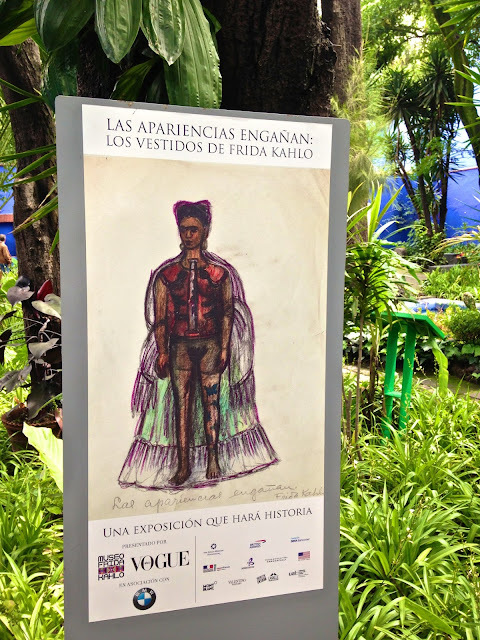 My trip planning started almost a year ago...first as a big smile to the universe when learning about the exhibition of Frida's wardrobe at Museo Frida Kahlo in Mexico City. 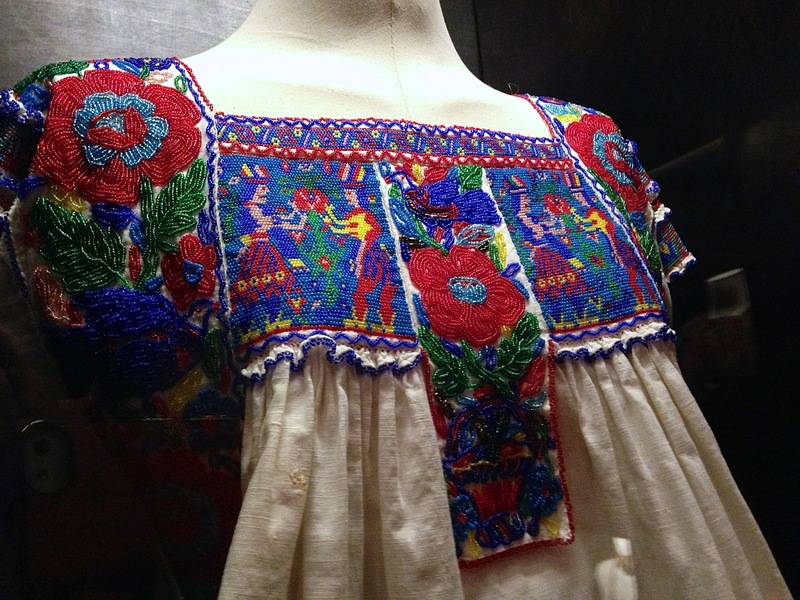 It would be a limited engagement showing clothing and personal belongings that had been sequestered for 50 years after her death as requested by her husband, Diego Rivera. Right then I told myself that this was something I had to see. 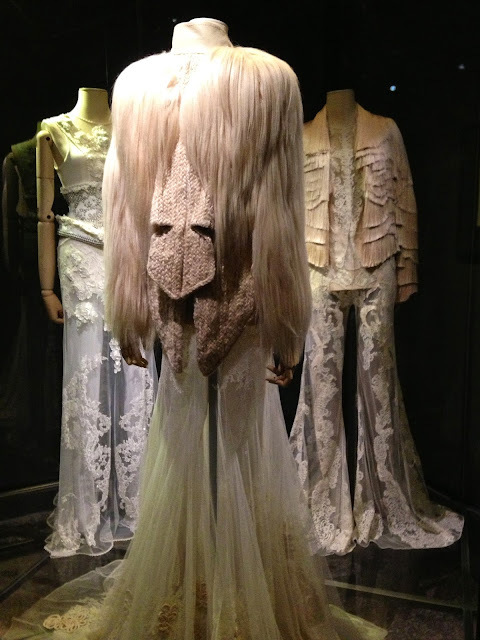 Besides being a longtime aficianado of her work, I have always adored her personal style. 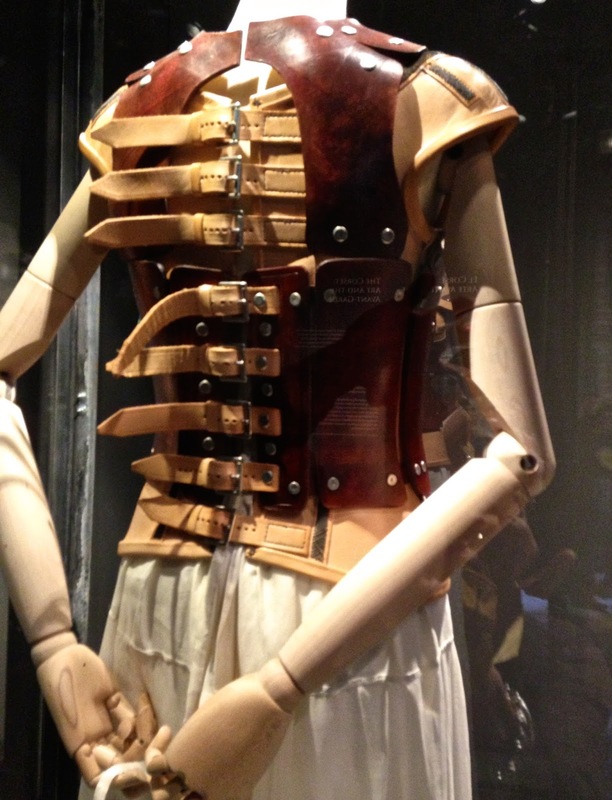 The exhibit also coincided with my 60th birthday. 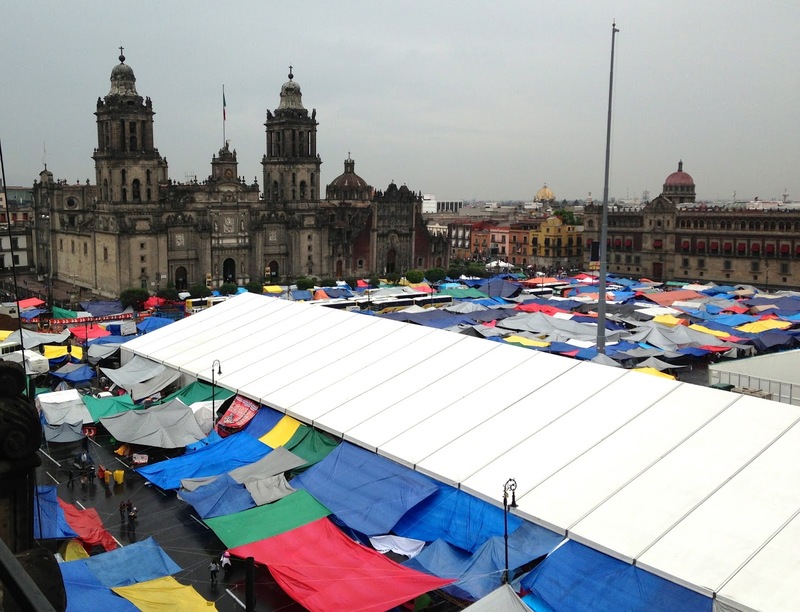 Although I had planned to hold a big party in our newly renovated back yard, the thought of traveling to Mexico City began taking shape. I talked to my husband about it and, although he didn't have an interest in going, he encouraged me to make it happen. So I did. I talked to a few friends who I thought might be interested and we formed a travel team of four. 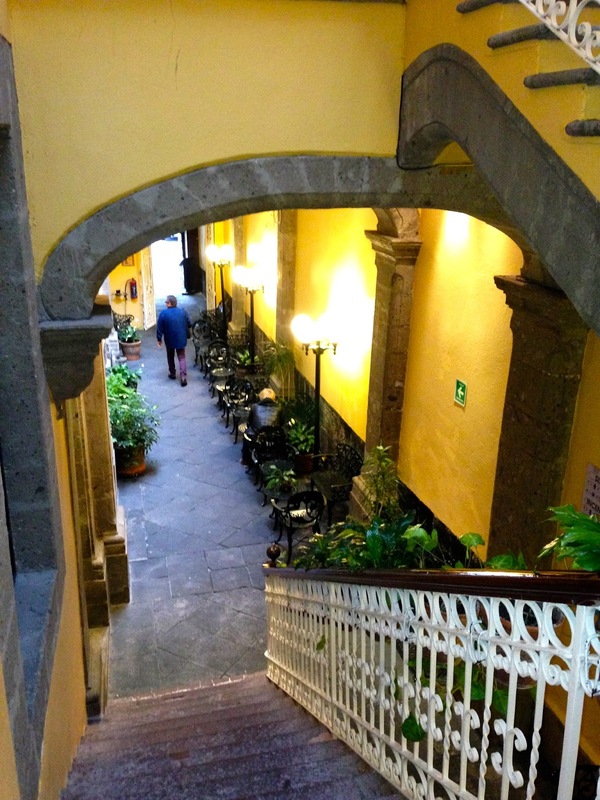 I consulted Trip Advisor and found a highly rated hotel in the central zocalo of Mexico City . We made reservations, booked our flights and prepared for our trip. 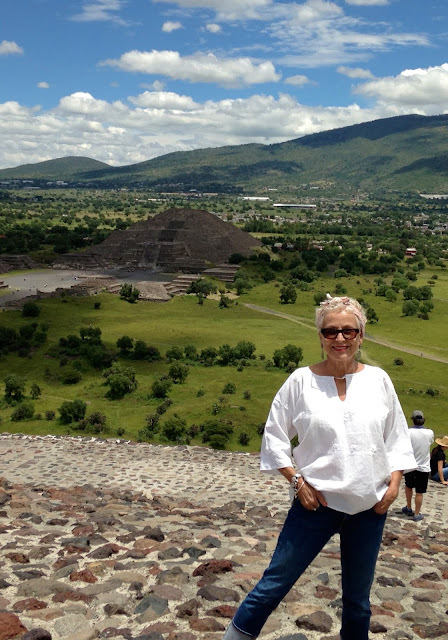 Prior to leaving, one of my travel companions booked a day trip to Teotihuacan, the ancient pyramids outside of the city. 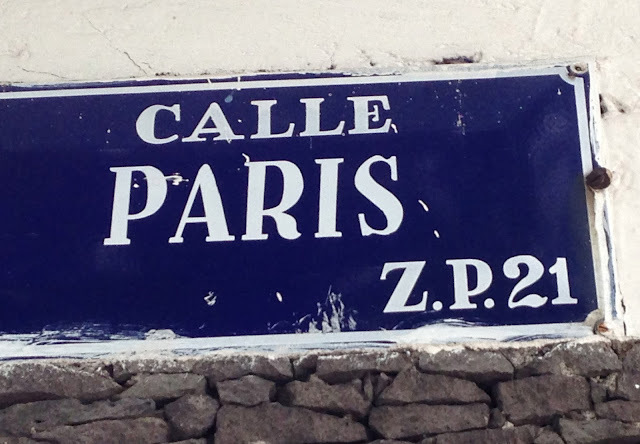 Our plans included a four night stay and almost five full days to see the sights. Note: I've broken up this blog post into a series of days. You may want to bookmark and read in stages. In the text, I've also linked to some information that you might find interesting. They're underlined and look blue until you click, then they turn red. We arrived at Gran Hotel de Ciudad de Mexico on August 20th in awe of its beauty. Although the ratings were high and the prices low, I never expected such grandeur and elegance. What a treat! 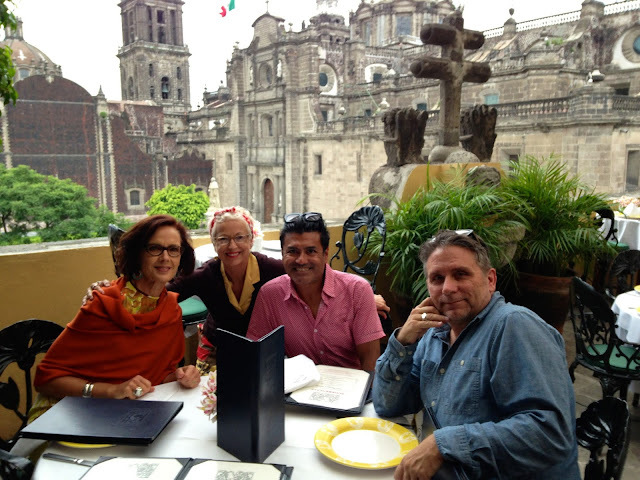 That night we had dinner on the hotel's terrace overlooking the zocalo. Our view was unexpected! There was a huge teachers' strike taking place and the plaza was covered in colorful tarps and thousands of people were hunkered down in protest of proposed legislation requiring mandatory teacher evaluations. It was a peaceful protest and although they created traffic issues and even closed down the airport for a day, we were unaffected. We devoted our first morning to the exhibit at Museo Frida Kahlo and the surrounding neighborhood of Coyoacan. I knew that I would love Casa Azul but I hadn't realized the extent to which the beautiful home and contents would move me. 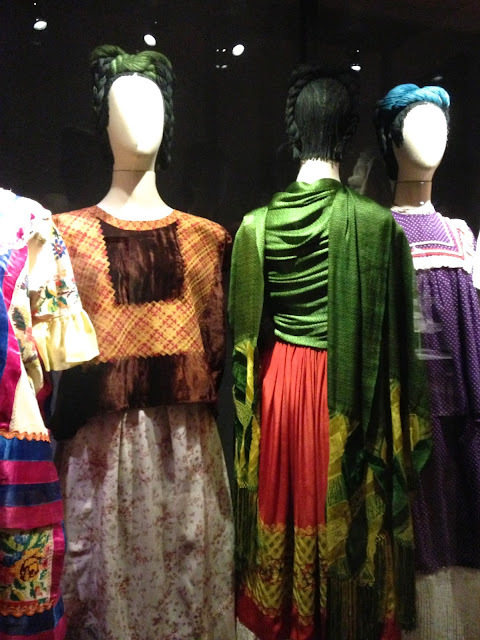 The exhibit (which changes frequently) included examples of Frida's colorful Tehuana outfits and personal items from her "Cabinet of Curiosities." I paid an extra 60 pesos for the opportunity to take photos. Here are a few of my favorites. "Appearances Can Be Deceiving- The Dresses of Frida Kahlo"
Inside Casa Azul, we were treated to beautifully curated rooms that included Frida and Diego's personal belongings. 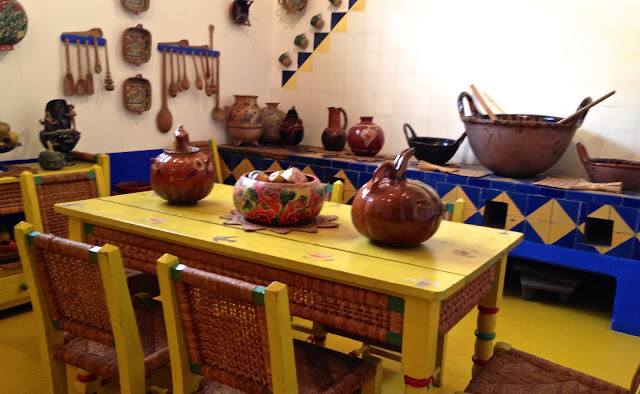 The bright and cheerful kitchen...the bedrooms with their collections of folk art...and Frida's studio- a room that glowed with colorful inspiration. 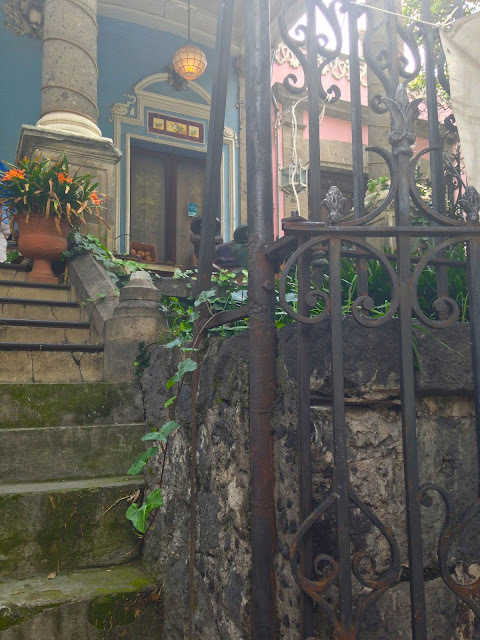 After leaving the exhibit we walked through the historic Coyoacan neighborhood, enjoying the colorful sights and exuberant people. 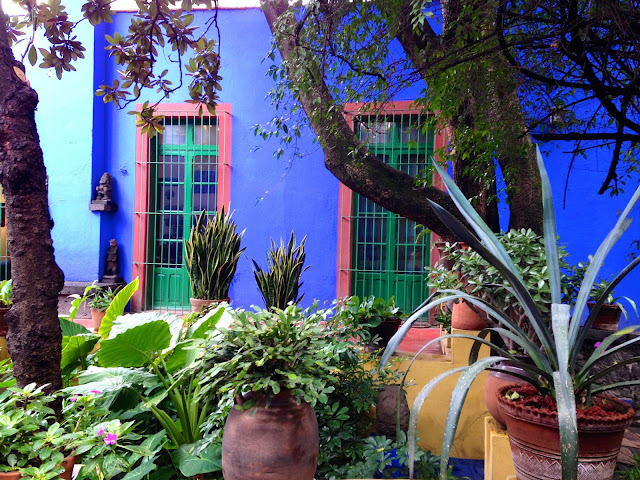 Our next stop was the home and studio of Diego Rivera and Frida Kahlo in San Angel. 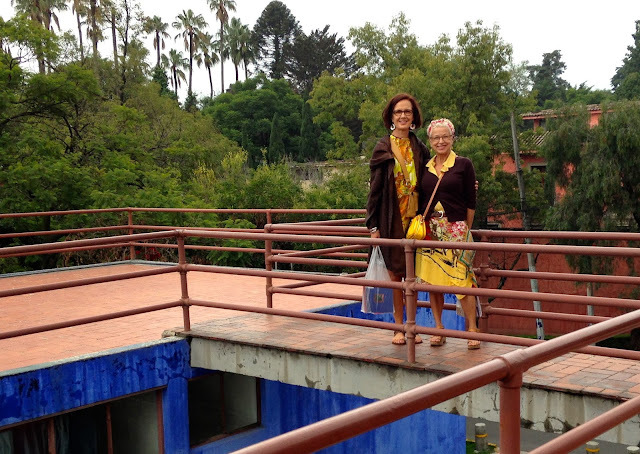 This is the home where they lived in separate structures connected by a bridge. 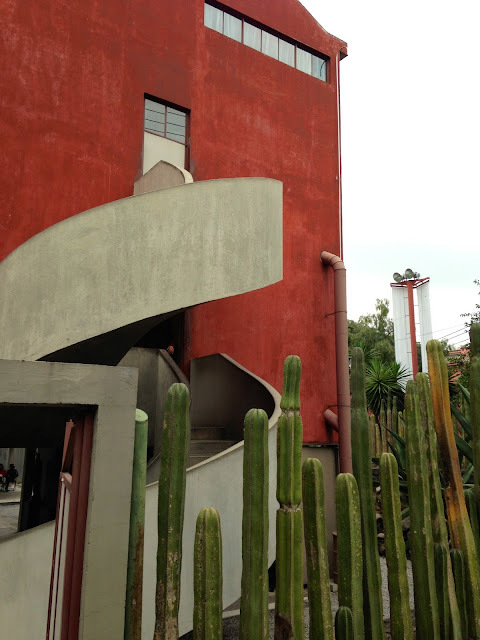 Designed in the functionalist style by Juan O'Gorman, it was wonderful to look at and aesthetically pleasing to tour. 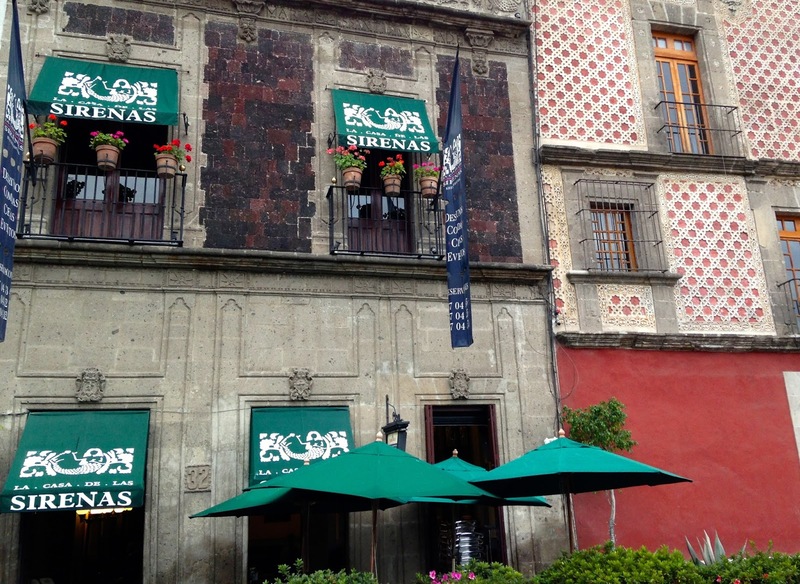 That evening we celebrated my birthday at La Casa de Las Sirenas (the house of the mermaids) in the historic district near our hotel. We had a wonderful dinner overlooking the cathedral. 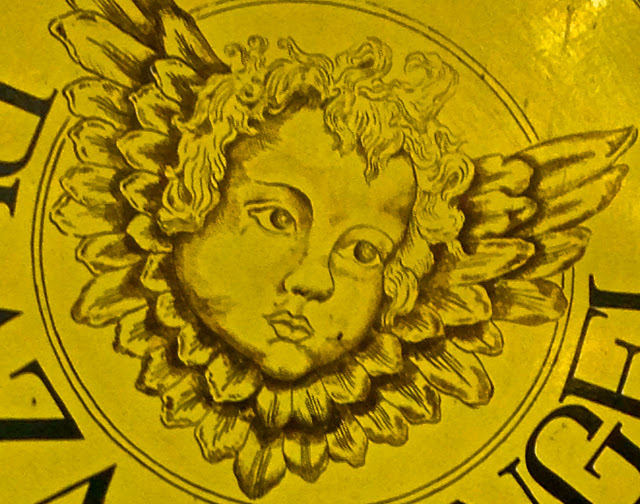 The museum with its stunning architectural details also includes a collection of the woodcuts and book illustrations by Russo-French painter Angelina Beloff, Rivera's companion during his early years as a budding painter in Europe. One feels the presence of Diego Rivera everywhere. Ms. Olmedo and Rivera had a long term and quite close relationship. As a younger woman, she had posed for 27 of his drawings. When Rivera was dying in the mid-1950's, Ms. Olmedo, by then divorced and wealthy, put him up in her home and helped care for him. 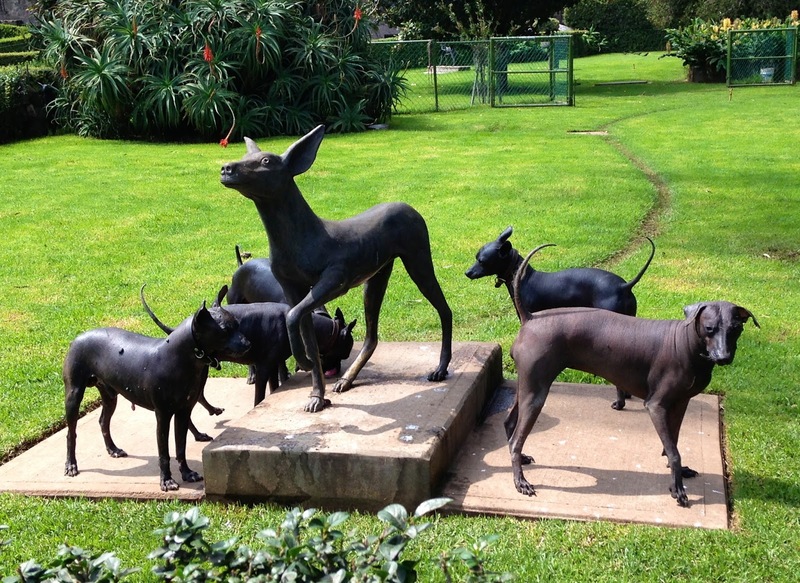 Near to extinction, the hairless Xoloiztcuintle dogs, a Precolumbian breed, are well cared for on the grounds. 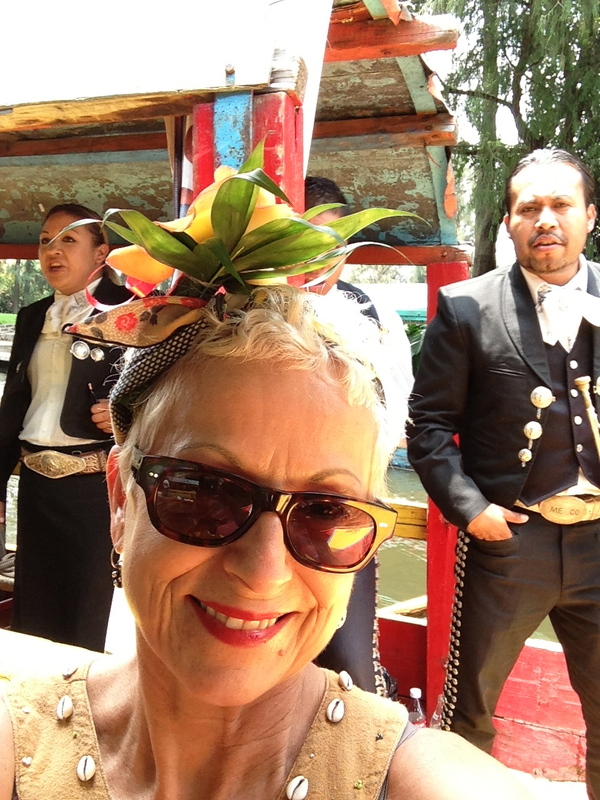 Our next stop was the enchanting Floating Gardens at Xochimilco. I had seen scenes of the place in the movie "Frida" directed by Julie Taymor and couldn't wait to experience it myself. In Nahuatl, the language of the Aztecs, Xochimilco means "garden of flowers." These canals and gardens provide a glimpse into the ingenious agricultural practices invented long ago. Today, the existing canals of Xochimilco represent only a fraction of their former acreage. 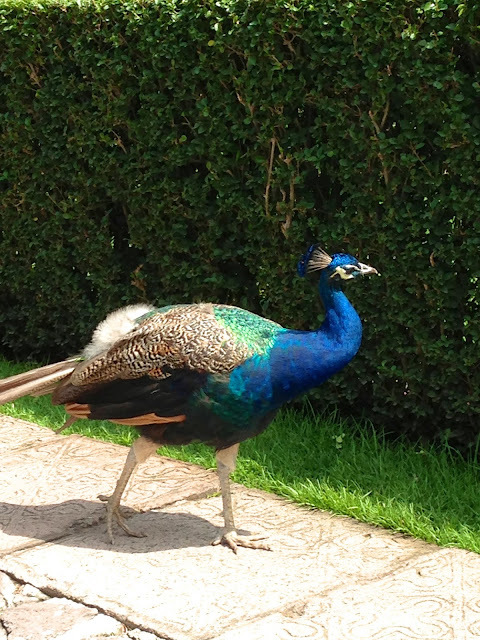 A portion of the canals have been set aside, dedicated to an ecological park, the Parque Natural Xochimilco. It's a spot for family gatherings and floating parties. 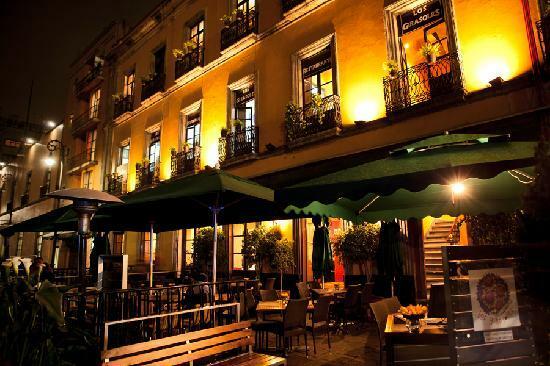 A mariachi band serenaded us with "Besame Mucho"
Dinner that night was at Los Girasoles- located on the square that houses he National Art Museum. 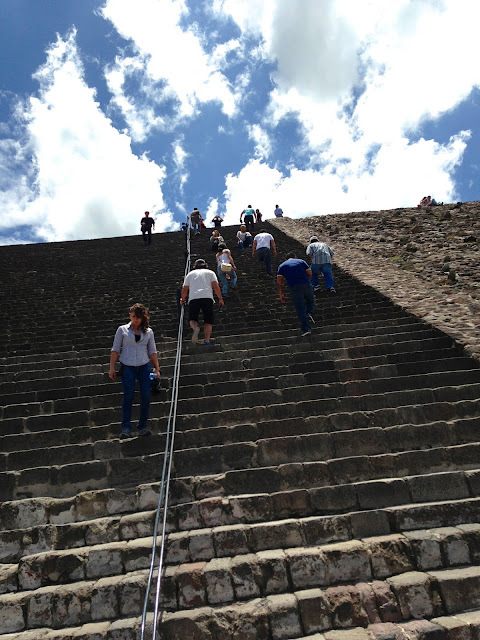 On Friday, we prepared for our tour of Teotihuacan, located about 45 minutes outside of the city. Our guide picked us up promptly at 9am...although the teachers' protest caused many street closures and detours. 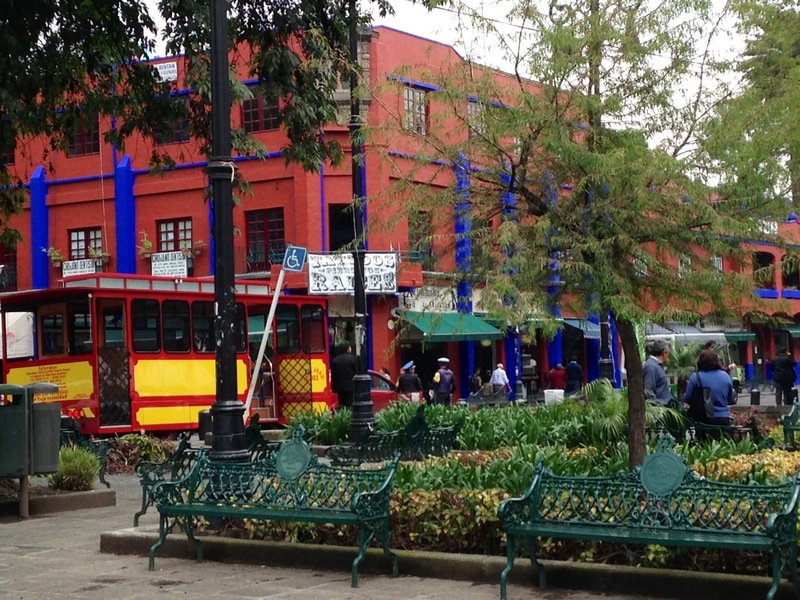 On the way we made an interim stop at the Plaza de las Tres Culturas. 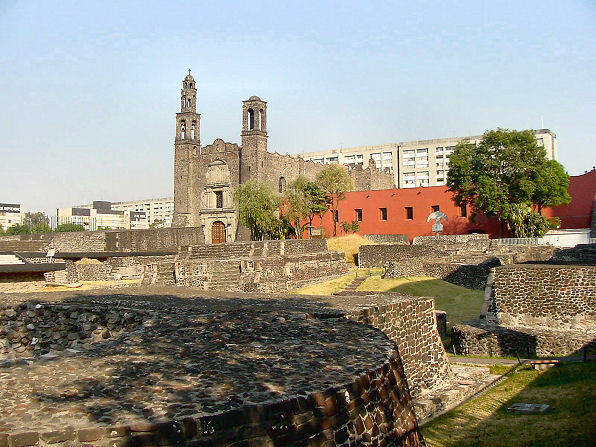 A brief explanation of the three cultures: In pre-Columbian times it was the centre of the city of Tlatelolco, whose people sided with the Spaniards against the Aztecs of Tenochtitlan. In colonial times, there was an important church here. Then in 1968, the area was the focus of a horrifying government massacre in the run-up to the Mexico City Olympics. 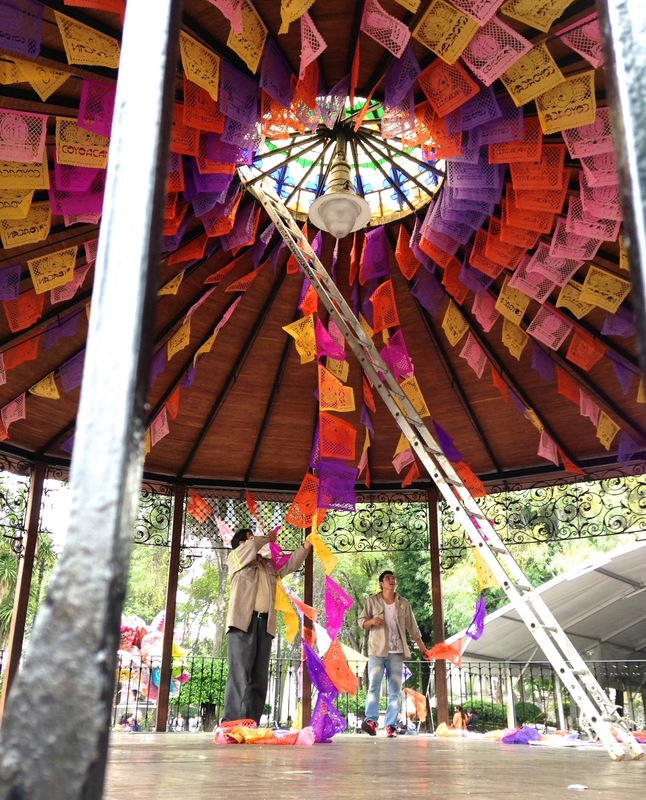 Hundreds are thought to have died, many of them local residents caught up in the crossfire- Mexico's version of China's Tiananmen Square. 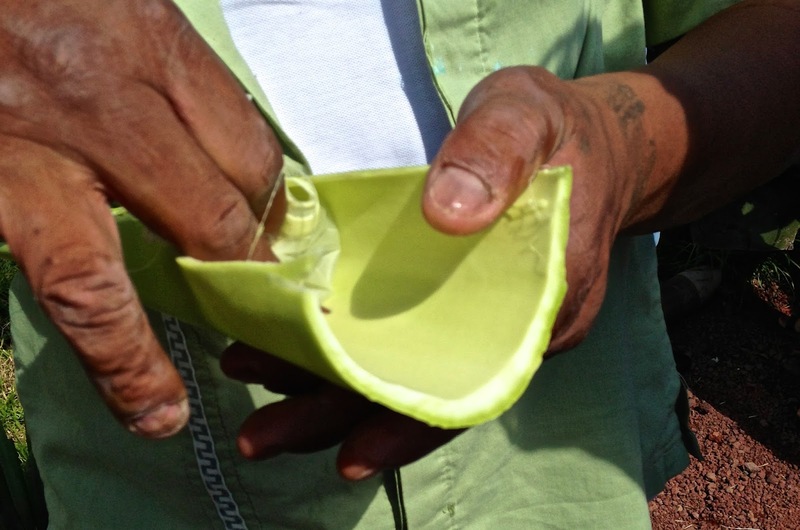 Another stop along the way at a small cooperative where we learned all about the maguey plant and its many uses. 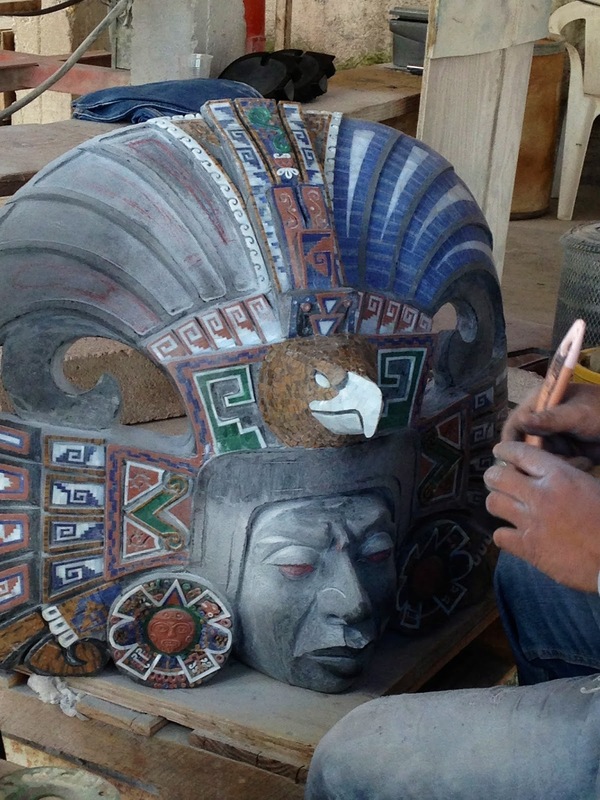 There were also artisans creating stone decorative items. 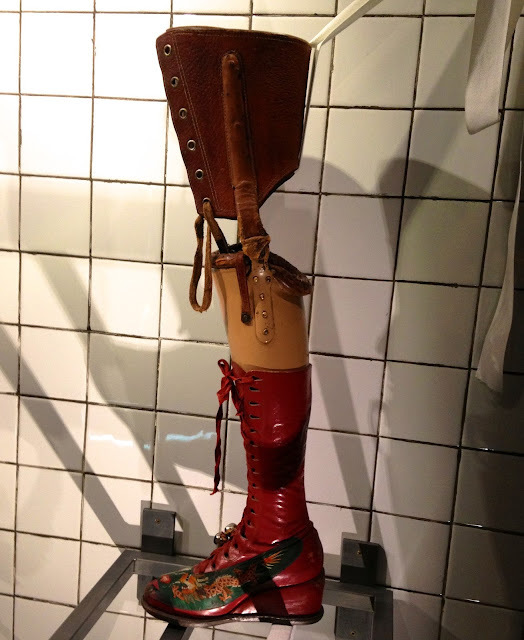 Yes, it was all quite interesting, but I was ready to climb a pyramid! 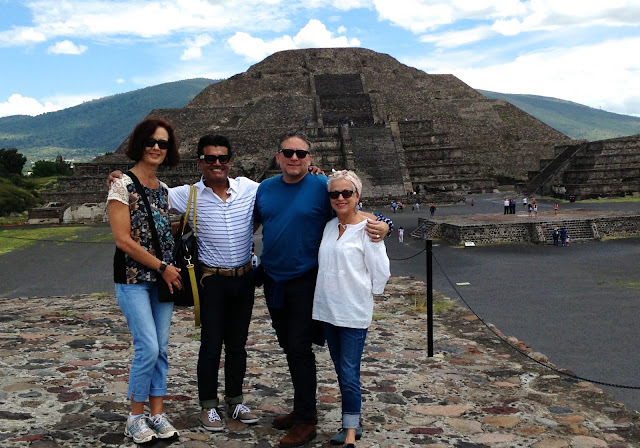 Finally...we arrived at Teotihuacan! After a brief lecture and tour through the multi-family residential spaces and the archaeological site which uncovered beautifully preserved murals, we headed toward the pyramids. Since the Pyramid of the Sun was accessible to the very top, that's the one we decided to climb. Although the altitude created a bit of heavy breathing, the trek to the top was not difficult. It felt amazing to look out over the valley. The big blue sky was filled with beautiful cloud formations. Truly one of those "peak experiences." Our final stop for the day was at the Basilica of the Virgen de Guadalupe. One of the most important pilgrimage sites of Catholicism, the basilica is visited by several million people every year, especially around 12 December, Our Lady of Guadalupe's Feast Day. The present church was constructed on the site of an earlier 16th-century church that was finished in 1709, the Old Basilica. 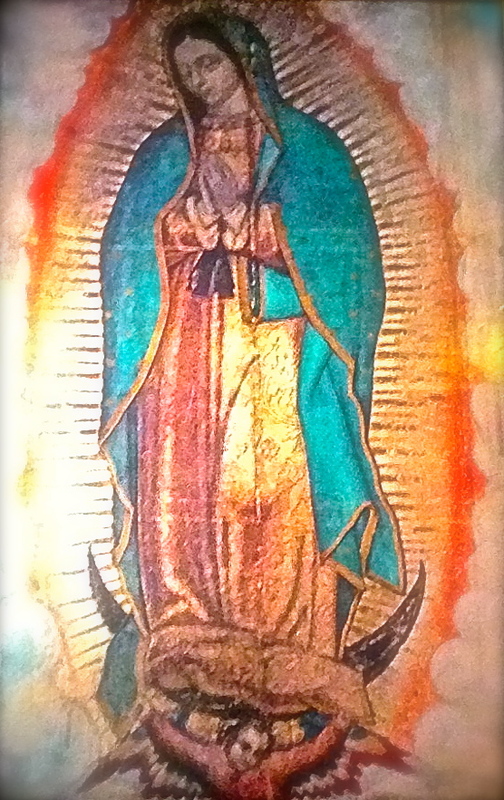 When this basilica became dangerous due to the sinking of its foundations, a modern structure called the New Basilica was built next to it; the original image of the Virgin of Guadalupe is now housed in this New Basilica. Note the differences in the three buildings. The center structure is leaning to the right and has been retrofitted for stability. The day ended with a long drive home amidst the typical Mexico City traffic. I amused myself by taking photos of happenings in and outside of the van. How can one be bored in Mexico City. Everywhere I looked I saw color, old buildings and interesting graphics. 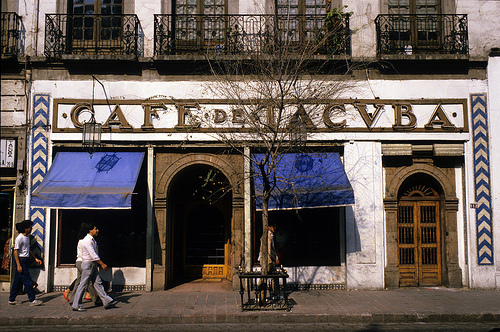 Dinner that evening was at a lovely little spot- Cafe Tacuba. 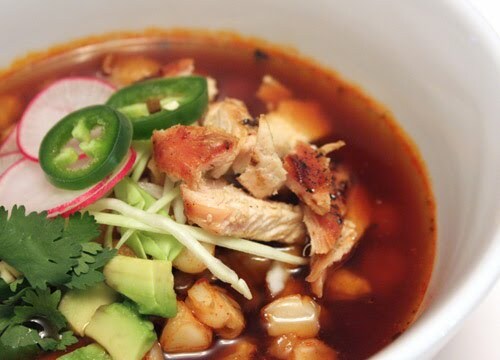 I ordered the pozole- chicken and hominy in a spicy red broth. That was sort of a "moment" for me because I have always regarded hominy as too "tooth-like" to be appealing. I'm glad I decided to try it- it was delicious. 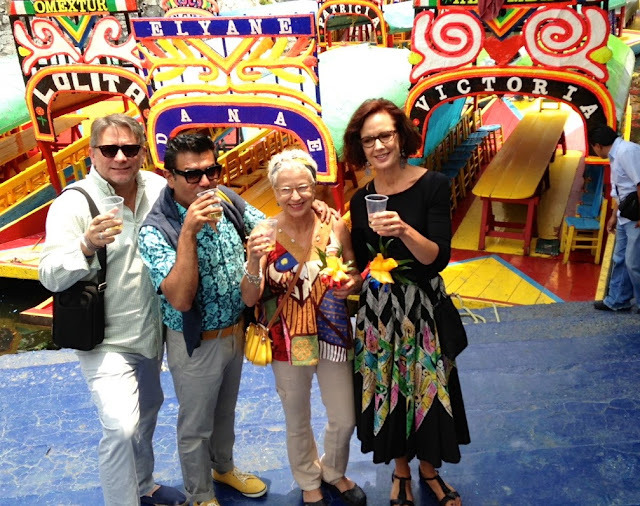 We devoted our last day in Mexico City to the art of shopping. There were a couple of mercados and flea markets that we had read about so off we went. Along the way we asked the driver to stop at this really weird junk store that we had spied earlier in the week. I'm sure he thought we were loco en los cabezos when we pulled up. For me, it provided some of my favorite photos of the trip. As you can see, I got a little artsy with them in Instagram. Unfortunately, it was closed. Well, maybe that was okay. We had some serious shopping ahead. 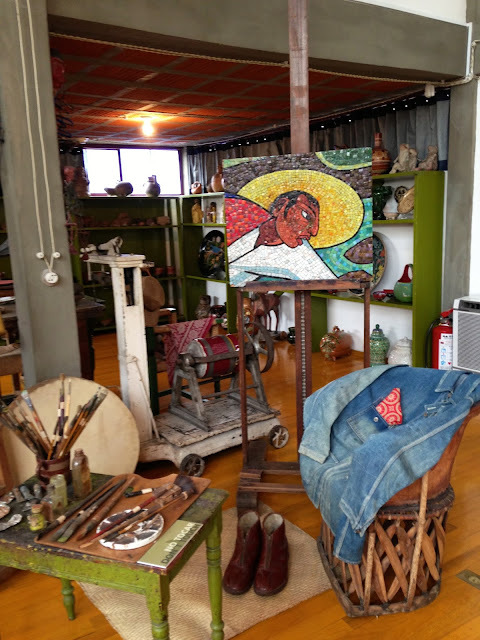 Another treat along the way was a public mosaic created in 1955 by a collaborative team of artists including Diego Rivera at Teatro de los Insurgentes. 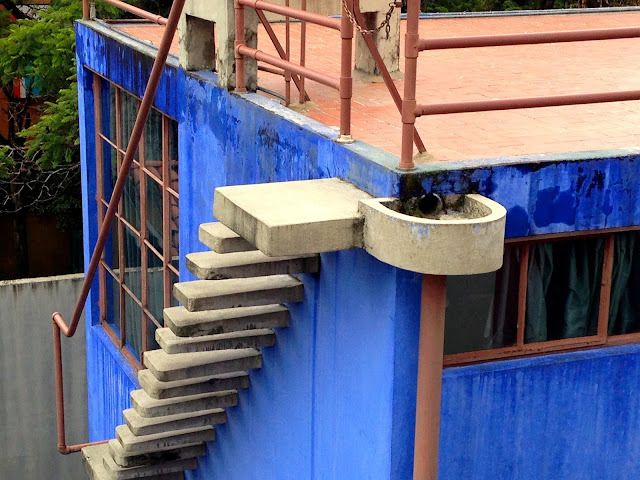 It was built by José María Dávila in 1953 as part of President Miguel Aleman's program of urban renewal. Dávila commissioned muralist Diego Rivera to createt La Historia del Teatro, a visual history of the theatre in Mexico on the building's façade. 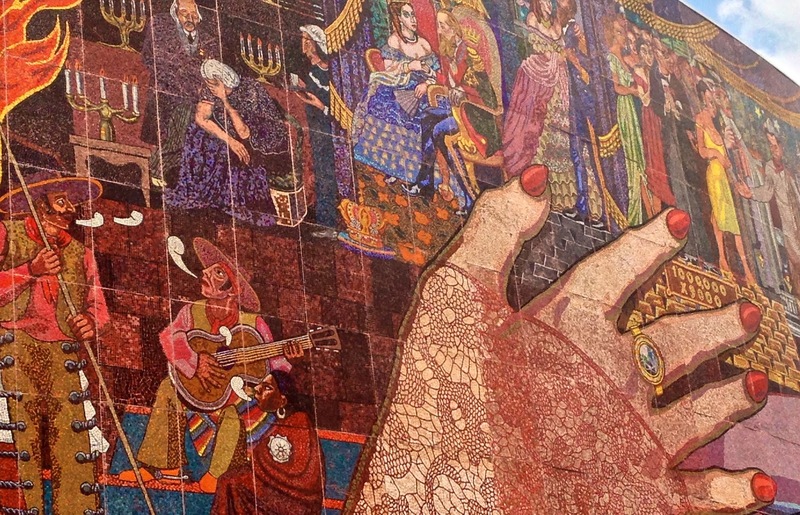 The artist placed the character of Cantinflas in the center of the mural in the form of a Robin Hood figure, distributing the wealth of the rich to the poor. We hopped out of the car for a quick photo op. 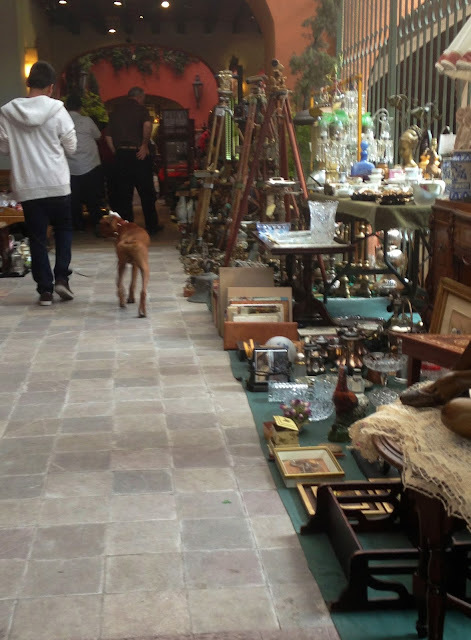 And then, yes, we arrived at the flea market in San Angel. Up until this point we had followed many bad leads to what I ended up calling Trinketlandia. All four of us are avid flea market shoppers so we were in consumer heaven. Finally, we had found the kind of shopping that we were hoping for. A true flea market, as we know them. Vendors sold a wonderful variety of Mexican and international antiques and collectibles. This was where my traveling companions did their lion's share of shopping. 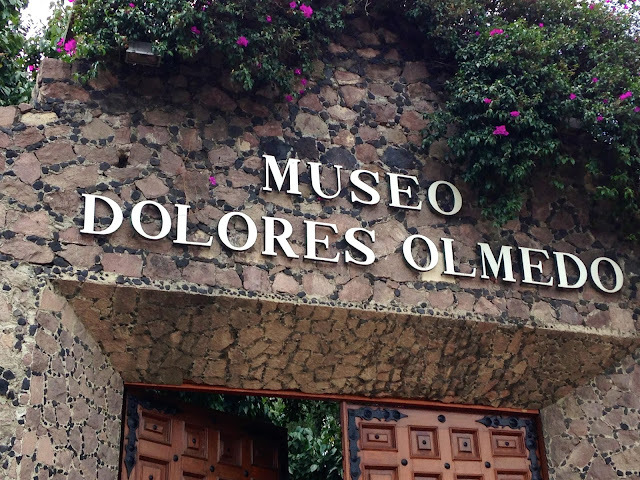 By then I had made my investments in Mexico and was happy to ooh and aah and take a few photographs. Plaza de San Angel antique/flea market- not to be missed! Our final shopping stop was Mercado de Sabado. 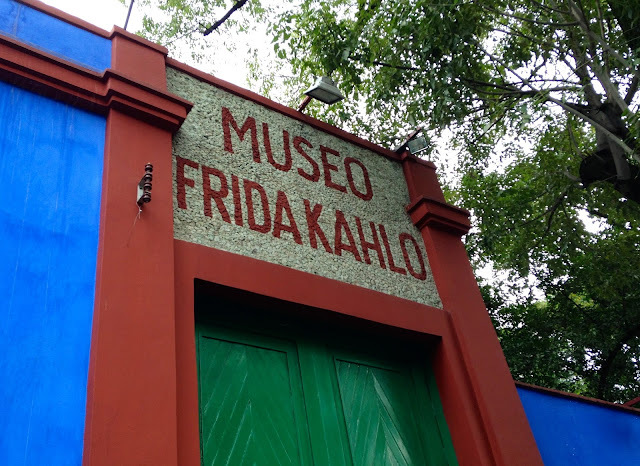 This was a more typical mercado filled with hundreds of vendors selling Mexican crafts- jewelry, embroidered clothing, leather goods, and, yes, trinkets in both a colonial building (have you noted the theme of "housed inside a colonial building?") 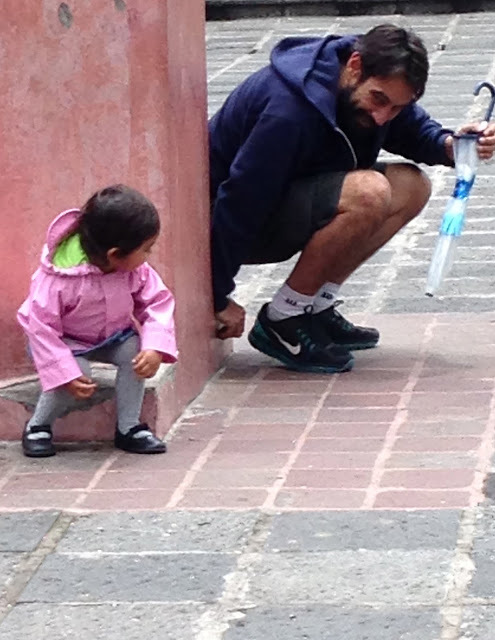 and on the cobbled streets outdoors. This was the point in the trip when my ankle began to lightly throb from walking the uneven streets....not that I let it stop me. Our spot for lunch. 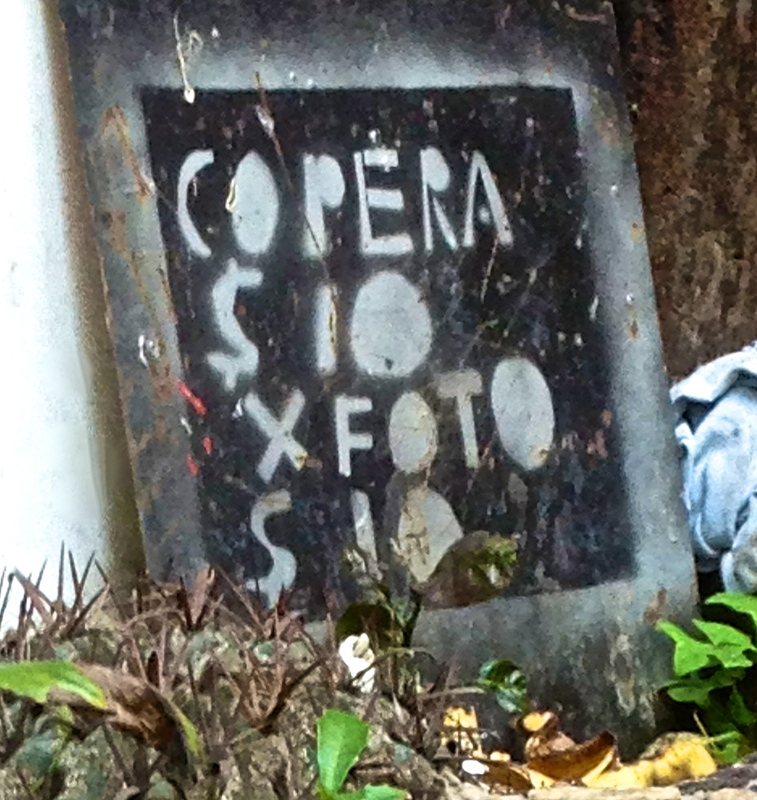 By this time my documentation skills were in serious disrepair and I don't know the name of the restaurant. A little off the beaten path. The contents of the store were not nearly as interesting as the architectural exterior. From here, our driver took us to the airport where we boarded our Aeromexico flight home. This was one of my favorite trips of all time. I am so thankful that I was able to celebrate my 60th birthday among friends in the beautiful country of Mexico. The only thing missing was my wonderful husband, Carl. And, finally, I'd like to thank those of you who attended my sale prior to leaving. Your support made this trip even more enjoyable. wow lori! i really drank that in. i would have been emotional too as you were. i probably would have started crying standing that close to her clothing. what an amazing trip, i'm envious of course but so glad you got to go!! Thanks, Deb. Glad you enjoyed it. It really was the trip of a lifetime. I feel so lucky to have been able to go. Absolutely fantastic! 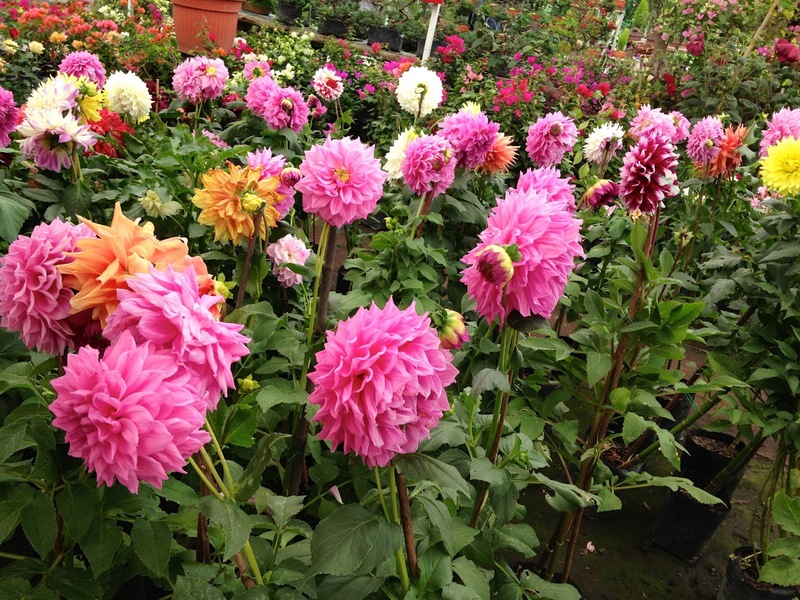 Thank you for sharing your thoroughly engaging photos and writing. I would love to do that exact trip! 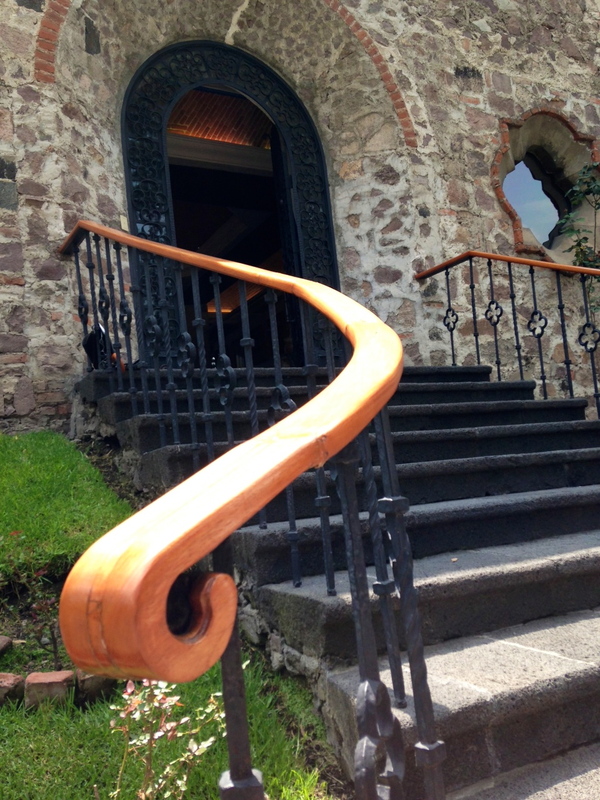 My husband and I just got back from San Miguel de Allende and now I want to jump back on the plane to Mexico City. Thanks so much! I'm so glad you enjoyed it. 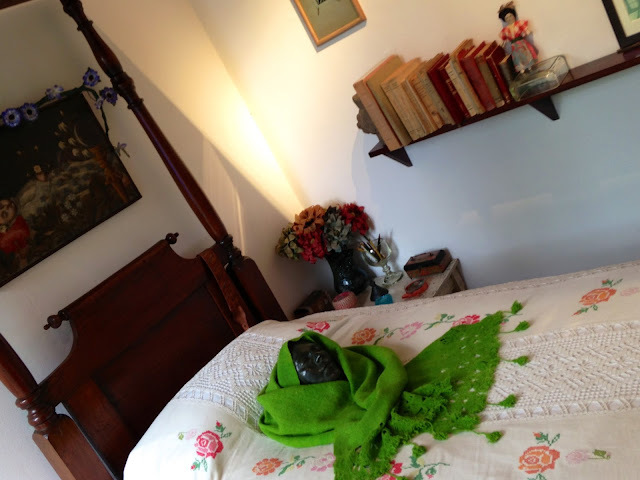 San Miguel de Allende is on my list, as well. 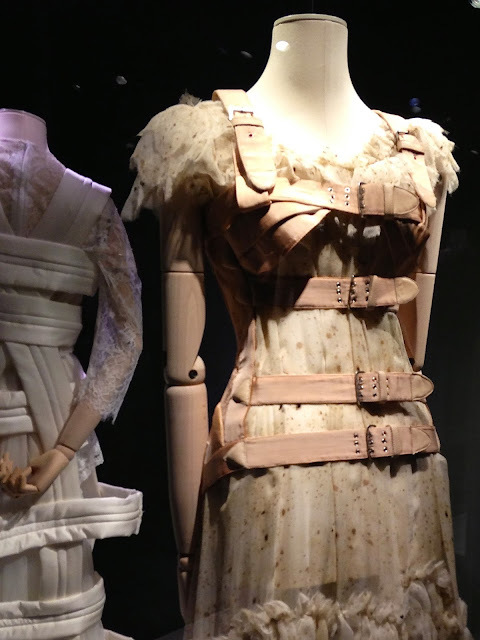 Two of my most favorite possessions in the world are from there. I avidly read this post through in one sitting. No way could I have broken it up and read it in stages, as you suggested1 Each day's happenings and photos are a feast for the senses. Thanks for sharing. I'll read it again, many more times, I'm sure!